November 4th, 2016 – At approximately 12:30 am, a Dane County Sheriff’s Office deputy attempted a traffic stop on a Ford Focus traveling 85mph in a 45 mph zone on County M near Signature Rd in City of Middleton. When the deputy attempted to stop the vehicle, it sped up and a pursuit ensued lasting approximately one minute. The pursuit ended when the suspect vehicle struck a stoplight at County Highway M at County Highway Q. Three people fled the vehicle on foot; one passenger was taken into custody by a Dane County Sheriff’s Office deputy. The City of Middleton Police, a Town of Madison K9 Officer, and a Maple Bluff K9 Officer responded to establish a perimeter and search for the remaining two suspects, but no one else was located. The Dane County Sheriff’s Office investigation to identify the driver and remaining passenger is ongoing. Today the pond is more serene. Nelson is sitting on a hulking slab of limestone, sipping a powerful beer and watching a flock of geese as they float quiet laps on the water’s glasslike surface. His white hair is blowing in the late summer breeze. He is talking candidly – it’s the only way he can talk, those who know him are well aware – about his past, his present and, most importantly, his future. Nelson is 60. 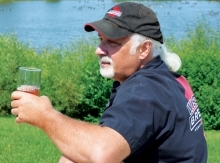 He is one of the founding fathers of craft beer in the Midwest. And he believes firmly that his best years are yet to come. It is violent and tragic, but perhaps the most surprising thing about the beginning to this story is the fact that, through some kind of literary alchemy, Chiaverini has managed to humanize Booth. He’s a villain, obviously. But he is also a human being. It’s an impressive feat, and it’s one only possible for a novelist who, after 25 prior books, is at the height of her powers as a writer. 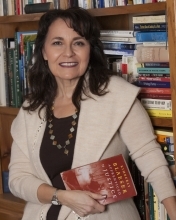 2015-2016 Wisconsin Poet Laureate Kimberly Blaeser is a Professor at University of Wisconsin-Milwaukee, where she teaches Creative Writing and Native American Literatures. She is the author of three collections of poetry: Apprenticed to Justice, Absentee Indians and Other Poems, and Trailing You. Blaeser is Anishinaabe, an enrolled member of the Minnesota Chippewa Tribe, and grew up on the White Earth Reservation in northwestern Minnesota. She is the editor of Stories Migrating Home: A Collection of Anishinaabe Prose and Traces in Blood, Bone, and Stone: Contemporary Ojibwe Poetry. She is currently at work on a collection of “Picto-Poems,” which combines her photographs and poetry. MTT: How did you initially become interested in poetry? It started with a little girl in southern India, riding in a car with her father and listening to classical music on cassette. Suresh’s father died when she was only nine years old, but during their too-short time together, he left what she describes as an “indelible” impact on her life. “My father worked a lot, and he traveled for work, but whenever he was with us he was completely with us,” she says tenderly as she drizzles honey from a plastic bear into a cup of spicy Chai tea in her kitchen. The music – primarily classical Indian music, as well as some classical Western – started in those early days with family, and she has never stopped learning about it, loving its beauty and its vastness, as well as teaching it. Deneen Carmichael is a mother of two and a small business owner. 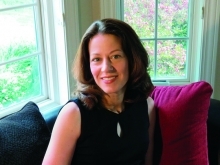 Jennifer Johnson is an international non-profit attorney. But those are just their day jobs, like Clark Kent’s gig at the Daily Planet. These local women are also part of a profession where courage and integrity are their most valuable assets. They can wake up in the middle of the night to answer their pagers and potentially save lives. They wear heavy, hot and uncomfortable clothing for work. They lug cumbersome equipment up tall ladders and pry open car doors following accidents. They hold the hands of people in need and comfort them in hard times. Carmichael and Johnson are volunteer firefighters with the Middleton Fire Department. Johnson has been living in Middleton for about two years. She bought a house and opened her own non-profit consulting company called NCG. She is also an international non-profit attorney and she loves what she does. It is almost time for lunch, so the kitchen at Restoring Hope Transplant House it is getting loud. Snacks are already set out on the kitchen counter. Coffee is brewing, as is conversation. At the corner of Terrace Avenue and Parameter Street stands an old Victorian house that many transplants families and patients have called home. Many people walk by, because the library, a bus stop and downtown Middleton are just a stone’s throw away. The Restoring Hope Transplant House was born in 2006 when executive director Cindy Herbst’s family went through a transplant process firsthand.